Publication History: This article is based on Chapter 3 of "The Log Analysis Handbook" by E. R. Crain, P.Eng., published by Pennwell Books 1986 Republished as "Crain's Logging Tool Theory" in 2004 and updated annually through 2016. This webpage version is the copyrighted intellectual property of the author. Do not copy or distribute in any form without explicit permission. The chief application of the NMR tool is to determine moveable fluid volume (BVM) of a rock. 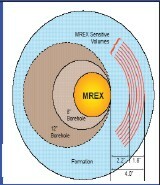 This is the pore space excluding clay bound water (CBW) and irreducible water (BVI). Neither of these are moveable in the NMR sense, so these volumes are not easily observed on older logs. On modern tools, both CBW and BVI can often be seen in the signal response after transforming the relaxation curve to the porosity domain. Note that some of the moveable fluids (BVM) in the NMR sense are not actually moveable in the oilfield sense of the word. Residual oil and gas, heavy oil, and bitumen may appear moveable to the NMR precession measurement, but these will not necessarily flow into a well bore. Micritic interparticle porosity and pin point vugs in carbonates may be included in the CBW fraction. This may cause a minor difference between effective porosity seen by conventional logs and from NMR, especially in clean rocks in which some of the porosity has very small pore size. The NMR log has been around since the early 1960's but it did not live up to it's hype until recently. As a result the log is rare and previous bad experiences still get in the way of its use today. Older logs attempted to measure the free fluid index (FFI), equivalent to the modern tool's bulk volume moveable (BVM). With stronger magnets and better processing, modern tools can usually give the irreducible water volume (BVI) and clay bound water (CBW). 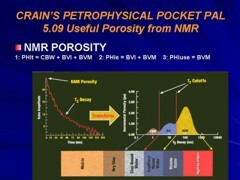 Effective porosity (PHIe) is the sum of BVI and BVM. In hydrocarbon zones at initial conditions, water saturation is BVI divided by PHIe. 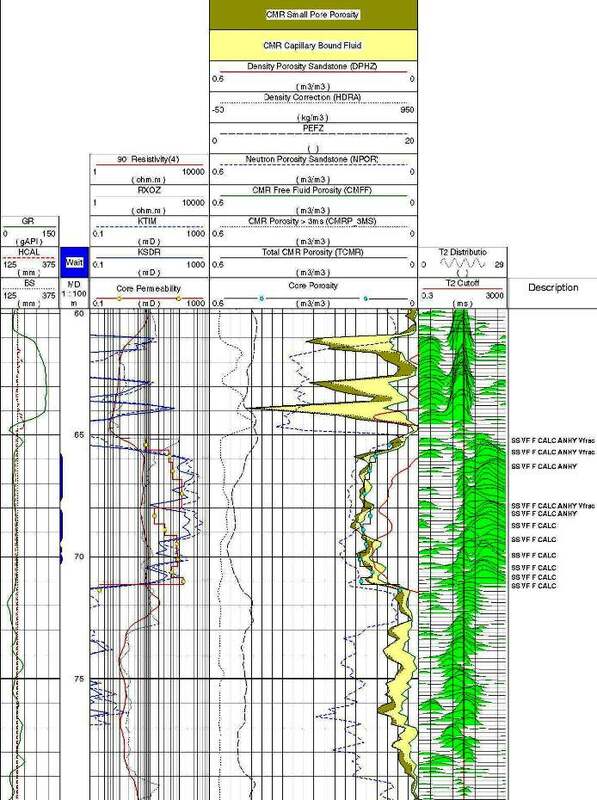 No shale corrections or resistivity log are needed. The rock volume measured is very small compared to density and neutron logs, so there is some possibility for inconsistent results when comparing NMR porosity to these sources. Unlike many other logging tools, the NMR design and operating principles are somewhat different between different service suppliers. A Schlumberger CMR tool investigates a chunk of rock about the size of a good Cuban cigar, about 1 inch from the borehole wall, in front of the permanent magnet on the face of the tool. Halliburton's MRIL tool (NUMAR design) measures a thin cylinder about 2 inches inside the rock, circling the entire borehole. The Baker Atlas MREX tool sees a 120 degree segment of a cylinder about 2 inches into the rock. The NMR is now widely used in unconventional reservoirs as it is immune to the effect of organic carbon (kerogen) so the effective porosity from NMR needs no further correctiom, unlike sonic, density, and neutron log porosity. and BVM. The T2 cutoff for the boundary between CBW and BVI is often chosen at 3 ms. In sandstones, the boundary between BVI and BVM is usually chosen at 32 or 33 ms, but in carbonates the cutoff could be much higher (80 to 120 ms) and varies with lithology. The cutoffs can be determined on rock samples in the lab. A sample of a modern NMR log is shown below. The depth scale (in feet) is at the extreme left in column A. In the right hand track – column E – there is a small graph at each depth illustrating the distribution of pore sizes as deduced from the NMR measurements. Below 6410 feet almost all the weight in the distributions is in small pores, as shown by a green peak to the left of the red line. Above 6410 feet the weight is predominantly in large pores, shown by a green peak to the right, indicating a coarse-grained formation. Thus a geologist can look at the NMR data and immediately recognize a change in rock texture at an unconformity in a formation more than a mile underground. A log of NMR-derived fluid permeability is shown in Track 2 (column C). The permeability changes by orders of magnitude in this section. In the fine-grained formation, the permeability is negligible, while in the upper coarse-grained section it is substantial. These results were used by petroleum engineers to institute an efficient production program for this well. (Track 3 - white area = irreducible water volume BVI), NMR pore size distribution (Track 4).